Children in grades K through 6 are invited to come to The Trove on Monday, January 14 at 4:30 p.m. to remember the late Reverend Dr. Martin Luther King, Jr. in a program of activities designed to celebrate his life. This program will feature a reading of the children’s biography, My Brother Martin: A Sister Remembers Growing Up With The Rev. 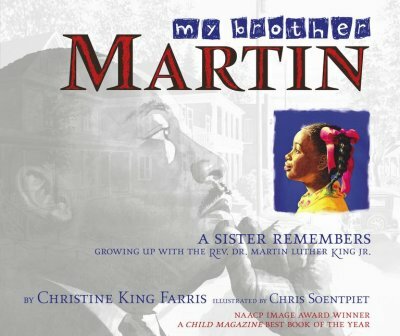 Dr. Martin Luther King Jr. written by Dr. King’s sister, Christine King Farris and illustrated by Chris Soentpiet. Interactive activities and a craft will demonstrate the idea of equality and justice for all. What better way for our youth today to learn about this great man than through the eyes of someone who knew him longer than most other people, his own sister? Christine King Farris tells of her family — Mother Dear, Daddy, and the three children, Martin Luther, Alfred Daniel and herself. They grew up in their grandparents’ house with their aunt. After being told that the they could not play with the white boys from across the street, Mother Dear told her three children the truth about how white people treated black people and their father showed them how to stand up for what is right. But their mother also gave her children hope that some day people would understand that everyone is the same. Martin’s response to her was that some day he would turn this world upside down. Join us in The Trove, Monday, January 14, at 4:30 p.m., to find out about Reverend Dr. Martin Luther King, Jr.'s dream that turned the world upside down! Tags: books, children, families, storytime, and The Trove.